Chico's is known for its sophisticated yet comfortable private-label clothes and accessories. Although Chico's is not exclusively a plus size store, they do offer items in extended sizes. The key is to understand Chico's sizing charts to translate your size to theirs. Unlike most retailers who sell plus size clothes 0X through 4X (or larger) or on a standard number system, Chico's uses its own numerical system to label the sizes of clothes which can be misleading if you're unfamiliar. Their unique system uses numbers 000 through 4, which translates into traditional clothing sizes 0 to 20. For pants, they come in petite, short, regular, and tall inseam lengths. The size chart page is divided into categories: Missy, Petites, Belt, and Swim by Brand. The Missy size chart is for standard sizes, and Petite is for shorter women who are 5 feet 4 inches or under. Keep in mind that not all items at Chico's are available in all sizes; most are available in sizes through 3 (which is equivalent to 16 in traditional sizing). The following chart can help you identify items that come in larger sizes and figure out what Chico's size you might need. For plus size petite gals, the chart below can help locate your Chico's size quickly. According to several reviews, Chico's clothing tends to run big, so you want to take measurements first and double check Chico's size chart before shopping online or head over to your local store to try on clothes in person for best results. Besides their clothing sizes, Chico's also sells accessories such as belts, which uses a different sizing chart. Their belts are available up to Large, which fits Chico's sizes 3 through 4 (equivalent to traditional sizes 16 to 20). Other accessories such as hats, scarves, and ponchos are one size fits all. Except for some ponchos that are listed with sizes from S/M (equivalent to conventional sizes 4 to 10) up to L/XL (comparable to 12 to 18). With nearly all items at Chico's being offered up to a size 16, and much more being offered up to size 20, there are several styles for you to consider. Travelers Classic Dress: This nifty little black dress debuted 20 years ago at Chico's, and it's still a fan favorite. It comes in regular and petite sizes up to a size 3 (equivalent to a size 16 in regular sizes). The dress has a higher neckline called a boat neck which offers more coverage than most necklines while also balancing a fuller midsection since it draws the eye to the shoulders. The length is midi style which means that it hits below the knee or mid-calf depending on your height. For this length style, wear high heels, especially if you're petite since the heels will help with getting your leg length back. It also features three-quarter sleeves and a figure-flattering silhouette. Priced under $100, it is a closet staple you can dress up for a night out with stilettos and an embellished clutch or dress down with kitten heels and layered with a blazer for the office. It's made from wrinkle-resistant fabric so you can pack it in your bag for your next adventure. Travelers Classic No Tummy Pants: These pants are priced around $69 and are available up to a Chico's size 4, but it depends on the color and length you select. Colors included are dark gray, black, jade, gray, sapphire, and mulberry. The pants have a relaxed, straight leg, an elastic waist, and darts in the front for a smooth silhouette that won't add bulk to your midsection. This is a style that can easily be dressed up or down, but are best paired with a top done in a longer length. Zenergy Neema Stripe Detail Jacket: This lightweight jacket can be worn numerous ways: add sneakers and jeans for a casual weekend look or heels and tailored trousers for a dressy occasion. The jacket is priced around $109, comes in carmine red and is available up to a size 4. It's made from Polyester and spandex so during colder months wear a sweater or hoodie underneath to keep warm. Zenergy Directional Lace-up Tunic: The lace-up detail adds a modern twist to a classic tunic. The top features a high neck (almost a turtleneck style), and it's made from cotton and cashmere. It comes in black and white and up to a size 4. For petite ladies, the tunic is available in pink and up to a size 3P. According to the reviews, the fit is loose but not oversized. Wear this chic top with your favorite jeans or leggings and ankle boots. Diamond Fit Girlfriend Ankle Jeans: A figure-flattering pair of black jeans should be part of your capsule wardrobe. These jeans feature a slim fit through the lower hips and thighs for a sleek and flattering finish. They are under $100 and include tech that slims and smoothes the tummy area. Available in three other colors and up to a size 4. Long Denim Shirt: This is another piece that's a wardrobe staple and can be worn all year round. Priced at around $89, this shirt can be styled by itself with leggings or printed jeans. It can also be layered under a sweater or coat for colder temps. This long sleeve button-up is available up to a size 3 and 3P for petite length. Chico's is known for their comfortable and fashionable clothes, but they also sell a range of other items. When you know what the sizing is like, you can get the clothing items you want knowing how they will fit, and top off your outfit with accessories to complete your look. Chico's has a wide range of accessories; all are done in the latest styles and coordinate perfectly with the clothing in the store. 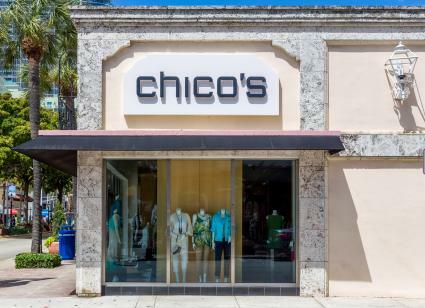 You can find scarves, belts, hats, bags and more at Chico's. Most items can be found at the boutiques and online.